Juan Cristobal says: – The fight to be the sole opposition candidate for Mayor of Maracaibo has been a tawdry affair. Primero Justicia’s Juan Pablo Guanipa, a council-member and strong opponent of current chavista mayor Giancarlo Di Martino, seemed like the front-runner early on. But then, the current governor of Zulia, former Presidential candidate and former two-time mayor of Maracaibo Manuel Rosales decided to go from the Governorship … back to City Hall. The campaign threatened to get ugly fast. Until yesterday that is. Initially, Guanipa and the entire PJ group did not take Rosales’ bid very well. Accusations of Rosales’ missuse of public funds began to fly, something we documented in this blog a while ago. It was interpreted as though Rosales was unwilling to pave the way for future generations and open up to other opposition groups gaining ground on what he considers his own turf. 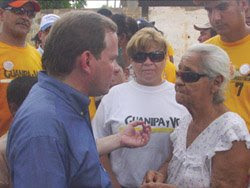 Rosales was portrayed as playing rough with the opposition unity pact signed last January, threatening its very existence. Well, Guanipa announced yesterday he was stepping down. He stated that the unity pact called for a decision on a single candidacy to be made in early July, and that it had to be based on opinion polls. He hired Datanálisis, Rosales hired Seijas, and they both concur: Rosales is the more popular candidate. So in the spirit of unity, he announced his decision in an uncommonly graceful speech. This gesture may seem like no big deal. After all, candidates decline and endorse rivals all the time in normal democracies. Yet this is Venezuela, where people who lose in primaries either “pass to their party’s reserve“, leave their party, decide to run anyway or question the method through which the other guy (or gal) was selected. I fully expect more than one político to announce in the coming weeks that this or that polling firm was “bought” by his rival or had some other flaw. So Guanipa’s gesture should be celebrated. With little fuss, he is stepping aside in favor of unity. He played by the rules, and he accepts the verdict – end of story. So far, the opposition has been talking a lot about unity. Now is the time for them to start putting their egos where their mouth is. Let’s hope more of them begin imitating people like Guanipa (or Armando Briquet, who is reportedly stepping aside today in Baruta) and start putting the interests of the opposition before their own.